1. Preheat the oven to 200ºC, gas mark 6. Fry the chorizo in a saucepan for 30 seconds or until it starts to crisp and turn golden. Remove with tongs and pour off the excess fat. 2. Return to the pan, add the tomato and basil sauce, cherry tomatoes, butterbeans and basil. Warm through for 1-2 minutes, then pour into an ovenproof dish. 3. 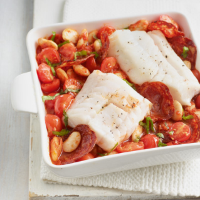 Top with the cod fillets and bake for 10-12 minutes or until the cod is just cooked through. Serve with the tenderstem broccoli. Butterbeans add vibrancy and colour to this tasty, filling fish stew. Like other pulses, they are great for providing protein, starchy carbohydrate and fibre – a satiating combination. Together, these nutrients work to prevent food leaving the stomach too quickly, helping to keep us feeling fuller for longer. An 80g serving counts towards 1 of your 5 a day, too.